A thoughtful addition to a child’s personal library can have lasting influence. The best books are never outgrown. There is no need for high-tech gadgets or books with buttons that emit electronic noise; all books for children ages 0-3 are truly “interactive.” By using a howly-growly voice, or a tiny whisper, the reader sets the tone of the book and brings it to life. Pointing to illustrations can jump-start giggly moments and great conversations. An enthusiastic reader will easily demonstrate to a child that books are to be jumped into full-force and savored for the imaginative interplay they inspire. Reading to the very young is so much fun. Not only does it foster sweet moments together, it effortlessly teaches the child lasting skills in reading comprehension. Later, when he is able to read quietly alone, the child’s own imagination will fill his five senses with story. 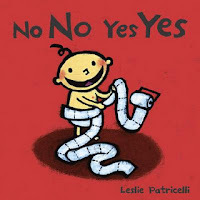 There aren’t any words beyond “no” and “yes” in this book, but it inspires endless giggles and lots of discussion. 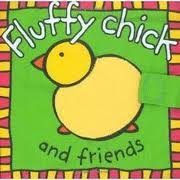 Illustrated in bold acrylics, an adorable one-haired, diaper-clad baby is the star of Leslie Patricelli’s board books. Baby presents opposites on facing pages: on the left, baby is tasting food from the confused dog’s bowl and the text says “No NO; on the right, baby eats a banana while the dog enjoys his meal and we read, “Yes YES”. Other titles such as “Baby HAPPY Baby SAD” and “Yummy YUCKY” are lots of fun to read. Patricelli’s sassy and sweet baby smiles and frowns in turn with the lesson he is learning on each simple page. 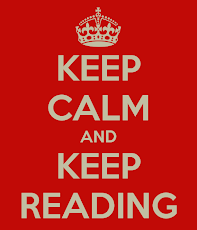 Cloth books are appealing for pre-readers because they appeal to so many senses. They can be chewed, slept on, and impatiently dashed to the ground with little consequence. Little fingers can easily grip the book and turn the pages. This book uses colors, contrast, texture and sound to the fullest. Its poly/cotton pages present recognizable farm animals each having a unique touch-and-feel feature. The first page has a crinkly layer in the batting to provide interesting sound, and the rhyming text is light and rhythmic. New this year, Little Golden Books are being published in a padded board book format for babies. Called the Golden Baby line, the new series has released four classic stories: “The Pokey Little Puppy,” by Janette Sebring Lowrey; “Baby’s First Book,” and “Baby Farm Animals,” by Garth Williams; and “Home for a Bunny,” by Margaret Wise Brown. Though you may miss the gold foil spine, still the Golden Baby books are chunky for the littlest hands to hold on to and sturdy enough to take in the car and on the go. This book is wonderful for children because it has amazing photographs of elephants in their natural habitat doing the things that elephants naturally do. Children will delight at these creatures running through mud and splashing in a river with ears outspread. There are great close-ups of wrinkled elephant feet, trunks and skin. Also, the book makes use of terrific verbs to widen budding vocabularies. 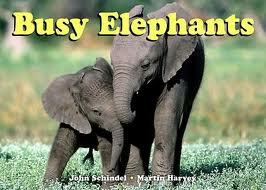 There are thirteen more books in Tricycle’s “Busy Book” series. Each book features one animal species magnificently photographed in full-color. These books are a nice first introduction to nonfiction reading. Of all the books available for reading to toddlers, my husband has always preferred sharing those written and illustrated by Sandra Boynton with our children. Glancing at her website (www.sandraboynton.com), I have found that this prolific author/illustrator/songwriter has created a LOT more books than even I knew about. My husband’s favorites are oldies but goodies: “Doggies” (Little Simon, 1984) – which will have you barking up a storm and learning to count, too; and “Horns To Toes,” (Little Simon, 1984) – a catchy parts-of-the-body rhyme that invites lots of tickles. The children never grow tired of the plucky illustrations or the delightful text. Boynton’s new books are great, too. My older children have especially enjoyed “Your Personal Penguin” (Workman Publishing, 2006) since we first discovered the catchy song version sung by Davey Jones of The Monkees (www.workman.com/boynton). At the time, we were enjoying the bovine humor from a recent volume for the older set, “Amazing Cows: Udder Absurdity for Children” (Workman, 2010) which is filled with poems, jokes and cow comics, all in Boynton’s signature style. Sandra Boynton’s nifty creations are whimsical and pure fun. M. D. Clark has four children (ages 0 to 11 years) and more books than she has room for.